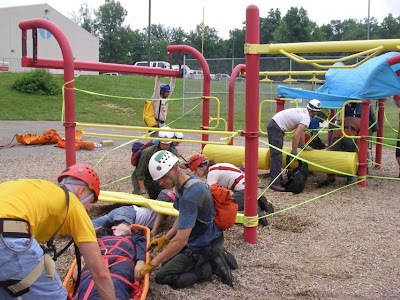 The last day of the cave rescue class is an all-day mock rescue. 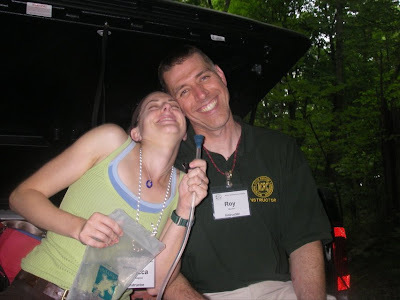 As an instructor, I had volunteered to tag along as a "bat" with the communications task force. That meant I would follow along and remain in the background unless any safety issues arose, and then I could squeak and offer a suggestion. 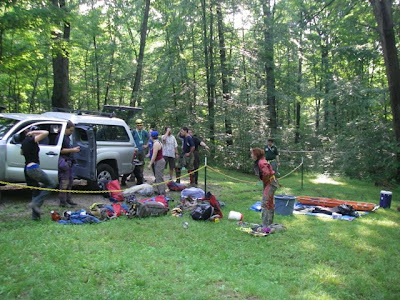 I arrived at Sullivan's Cave soon after the mock rescue was announced and watched the first group arrive with their personal gear and some group gear. 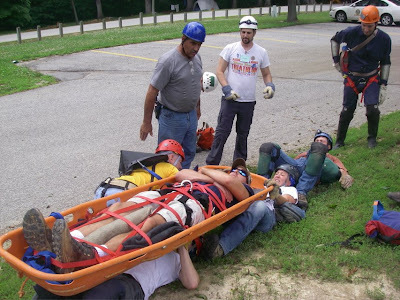 They also brought the reporting party, Don, who said he had been caving with three friends and one had gotten hurt and he had come out to get help. He offered to take the rescuers into the cave, but instead he was offered a chair and was repeatedly questioned by Marty to get every ounce of information out of him that she could. 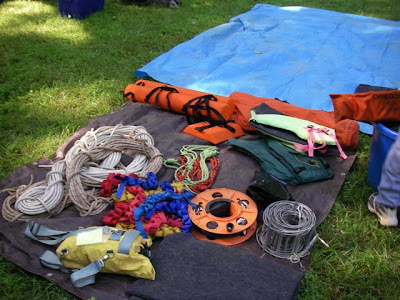 Meanwhile, a gear cache was being assembled with ropes, wedding, communications wire, a cable ladder, an IRT pack, a litter, and more. 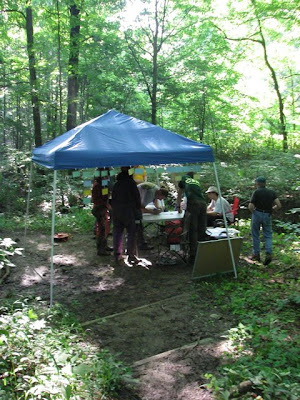 A tent was set up over the Incident Command Post. And then the comm team was sent into the cave as the second team and I started following them. They did an excellent job laying the wire quickly and keeping it out of the way of subsequent teams. 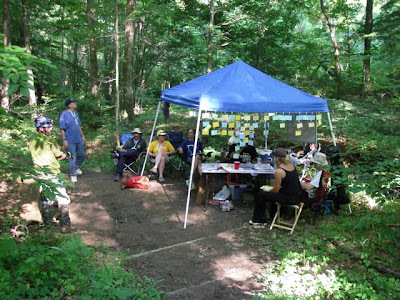 Usually later teams that enter the cave are told to follow the comm wire. The biggest compliment this team got was one team got lost because they couldn't find the wire, it was camouflaged so well! 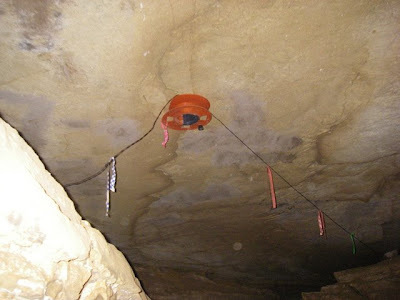 The comm wire allows military field phones to be hooked up and communications between the cave and surface to occur. 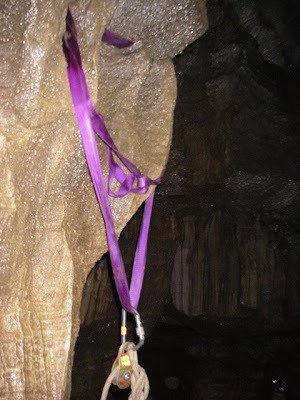 It saves a lot of time and energy than having someone going in and out of the cave to pass notes, especially with difficult passage. As the comm team waited for more wire after running two spools in, we watched one of the "original cavers" exit the cave. 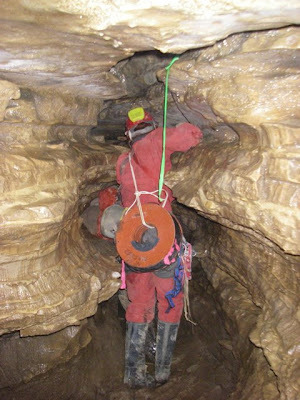 He had hypothermia and made it difficult for his rescuers, but they persisted and did an excellent job of moving him out of the cave. 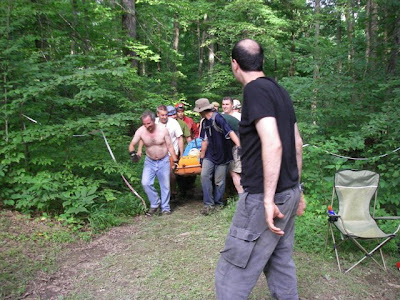 Meanwhile, another member of the "original cave team" had gotten lost while trying to find the entrance, but a search party found him in short order and got him out of the cave. 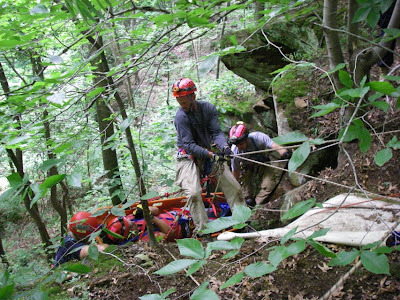 That left just the injured caver, Jess, to get out. Jess had a tib/fib fracture (broken leg), so she had to be packaged in a litter. 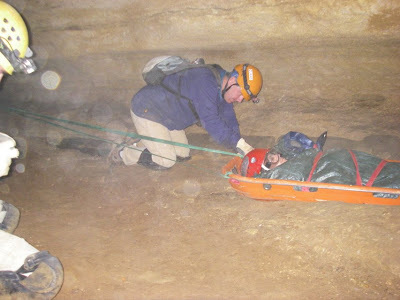 Part of the cave was steep, so a rigging team prepared it for her exit. Jess was moving before I got to see her. She was in a cave passage with waist-high water, and some of the rescuers were starting to get cold. 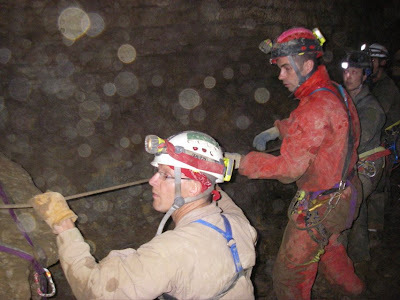 So I traded places with another "bat" and followed some of the cold rescuers out of the cave. On the way I managed to snap a photo of the great placement of this comm wire spool--on the ceiling out of everyone's way. 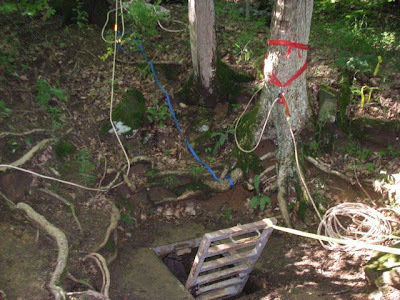 The entrance area was rigged with three different haul systems. 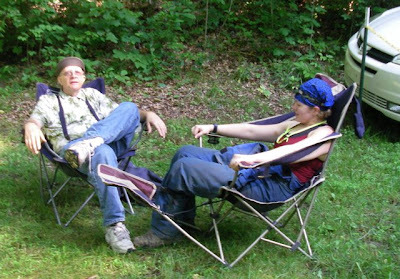 Jeff and Ellen patiently waiting for the patient to arrive at their part of the cave. The area right outside the cave was also rigged. The Incident Command Post had many more nametags hanging down from the awning, signifying who was doing what on the incident. Finally a group arrived carrying Jess from the cave entrance to the parking area. Hurray! She was unpackaged and a real medical doctor made sure she was okay. She was a bit on the cold side despite a wetsuit and blankets, but after a few minutes she seemed to be warming up just fine in the thick Indiana heat. The rescue wasn't over just because Jess was out. 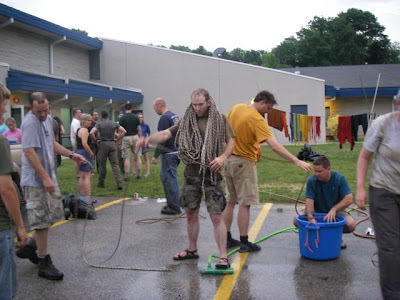 There was still lots of gear to be washed! 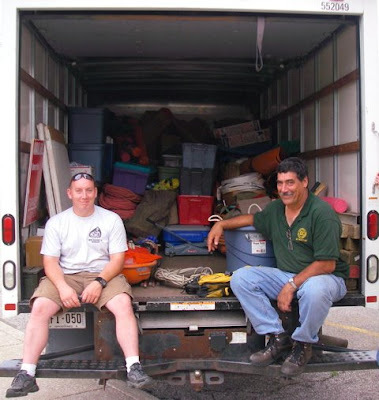 And then the final step--Billy and Harold loading it into the big U-Haul truck and storing it until needed for a cave rescue--or next year's class. It was a great 2009 class. Thanks to everyone who participated and helped make it happen. Usually I post a desert destination on Mondays, but this week I have a fascinating destination from the Midwest, where I recently visited. 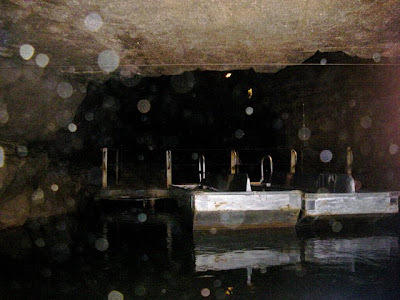 One evening after cave rescue classes, I was able to get away to nearby Bluespring Caverns, a commercial cave with boat tours along the Myst'ry River. 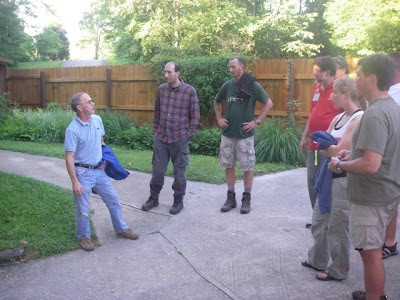 Our after hours tour began with the owner, Jim Richards, giving us an orientation outside the visitor center/gift shop. Then we walked right under the building and down a steep path into a huge sinkhole, with tall trees rising all around us. As soon as we got near the entrance, the temperature dropped from the 80s to the 50s. 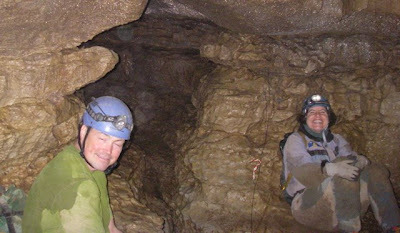 The interior cave temperature is about 52 degrees Fahrenheit. We could hear water before we see it, and we kept going down and down until we reached the river. 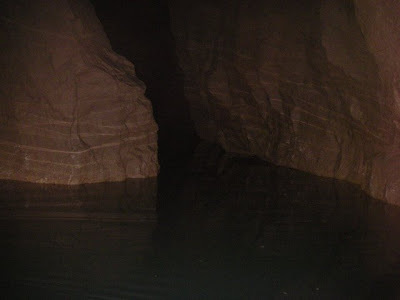 Bluespring Caverns has the distinction of having over 21 miles of passage in it, including three miles of navigable cave stream passage, the longest in the U.S. We boarded a boat to begin our voyage. My pictures don't do justice to what a magical trip it was. Once we left the dock, the only lights were those on the boat, so it was dark up ahead and dark behind us. 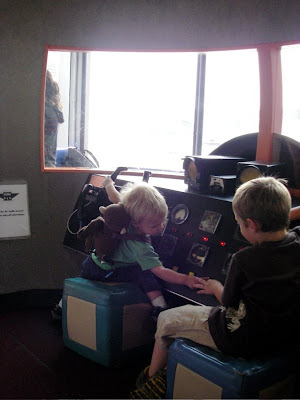 We felt like explorers (with a really knowledgeable guide). At times we could see that the water was only a few inches deep, while other times we didn't know how far the murky depths extended. 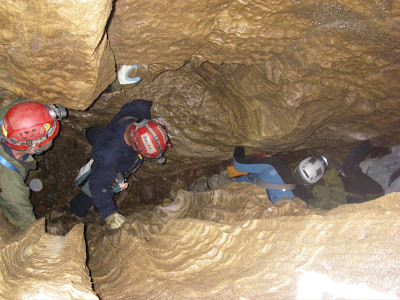 Much of the cave has been explored by cave divers, who have found numerous side passages, like the one shown above. We could even feel some air flow from this hole. The cave was found in the 1800s and we could only imagine what the earliest explorers thought as they went about with rudimentary gear. 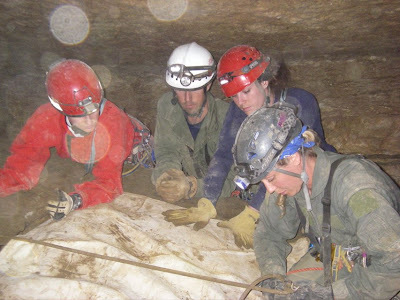 Being an ecologist, one of my favorite things was looking for cave life. 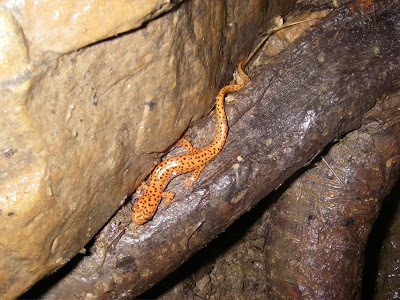 I saw some white crayfish and also cave-adapted Northern Cavefish (Photo above, courtesy of Bluespring Caverns website). The fish seemed to like hanging out near the walls of the cave. 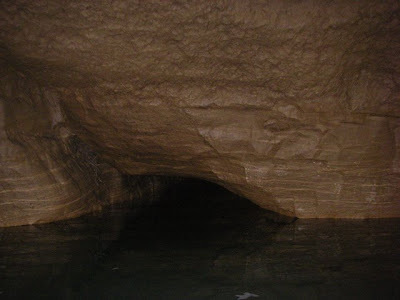 Not only were the sights marvelous, but also the sounds of the cave, the gentle movement of the boat, and the river's current as it moved through the cave, slowly eroding away the limestone rock to make larger passages. The tour lasted about an hour, and then we got to take a peek at the overnight facilities. 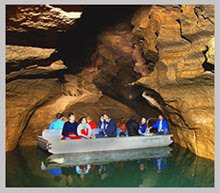 In the winter months, the caverns offers youth group camping, with a boat tour, a "wild" adventure tour, and then camping on bunkbeds in an upper part of the cave. It looked like it would be a lot of fun. I would definitely recommend a trip to Bluespring Caverns--it kept me smiling the whole time and I can still picture myself cruising slowly on the underground river. 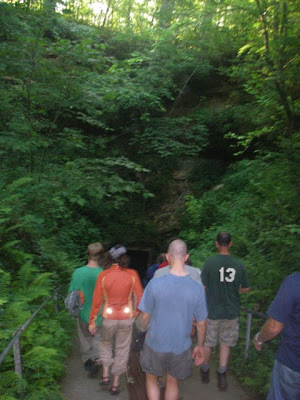 For more information, take a look at the Bluespring Caverns website. 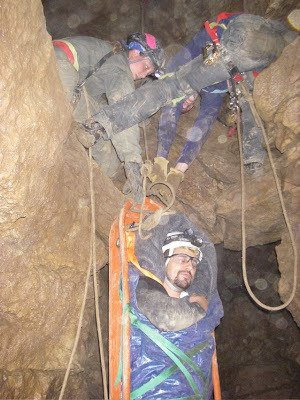 I've had time to sort through some of my cave rescue practice photos and here are some of the better ones. At the beginning of the week we practiced packaging a patient, something the students would repeat over and over in different exercises. 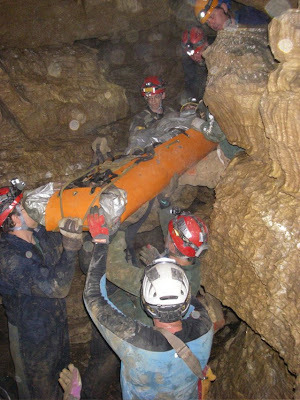 The main difference of packaging a patient in a cave from a surface search and rescue is the extra insulation and vapor barrier that is usually used in caves to help warm the patient. Many caves in the U.S. tend to be on the chilly side, especially if you spend some time laying on wet rock. Then we practiced some litter movement. Again, it isn't always as easy in a cave as on the surface. 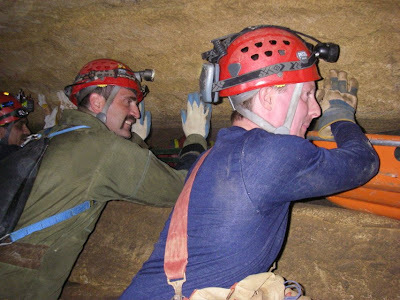 This technique is called pavement, when rescuers "pave" the cave bottom and send the litter over them. 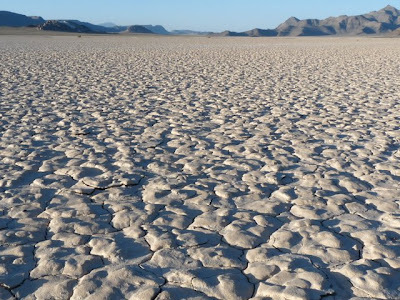 It can be used in wet, rocky passages where it wouldn't work to drag the litter. After practicing some techniques, it was time to go to the obstacle course to practice some of the moves. 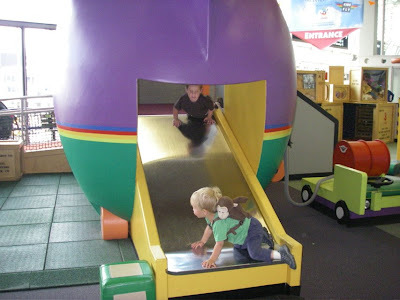 I'm sure some people have never thought of a playground in these terms--and will never do so again. The litter had to go through the monkey bars and out the other side. 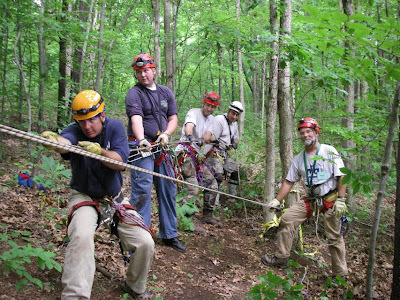 Later in the week we went out to a cliff site to practice rope techniques. The hauling team looks like they're putting some effort into getting the litter up the cliff. We used a variety of techniques and positions with the litter orientation and the litter attendant. Everyone agreed that having the litter attendant on a separate line makes the haul much simpler. In the photo above, the litter attendant (Wayne) is above the litter. After the exercise, a couple instructors, Rebecca and Roy, posed for a photo. 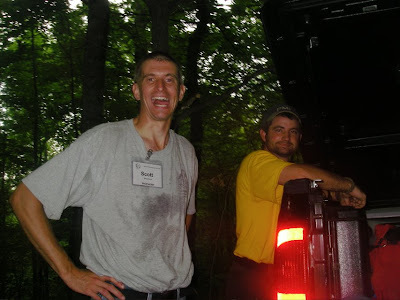 And here are Scott and DJ, two more instructors. 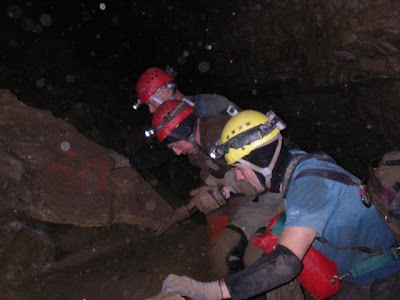 Another day we went into a cave for some litter handling practice. Our first obstacle was the cave gate. A salamander was hanging out below. Then we walked down a narrow canyon passage. In some parts of the cave, moving the litter was rather straightforward. So the instructors (Bil and Jim) created an artificial wall to simulate a smaller passage. Then it was time to try out the SKED litter in the canyon passage. It was a good workout for everyone. In a couple days I'll have some photos up from the ten-hour mock rescue. Tomorrow is a more relaxing cave post. Desert Boy figured this out all on his own. I won't be surprised if he ends up liking caving. 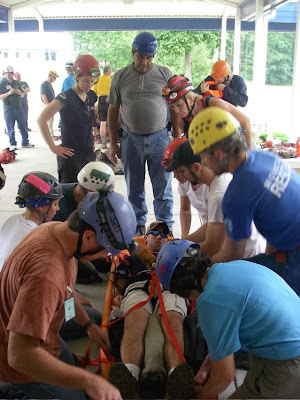 Back in the Midwest, while Desert Boy got to have a vacation with his grandparents, I helped teach a cave rescue class. 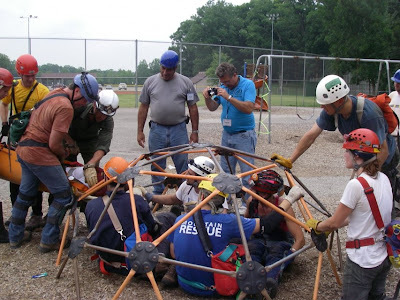 I started getting into cave rescue about 10 years ago and took a series of courses that led to me becoming an instructor for the National Cave Rescue Commission, which holds a national week-long seminar every year. 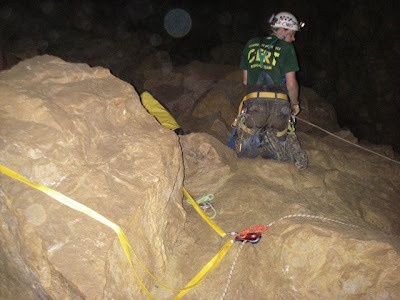 This year we were in Indiana, which has thousands of caves in the southern part of the state. 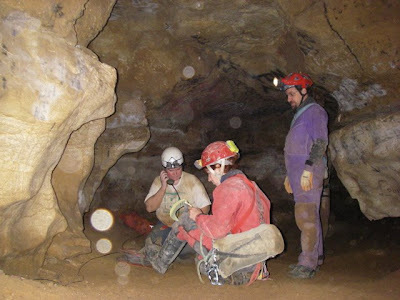 There are several different classes, and each spends time in the classroom and in caves practicing. I particularly like the in-cave exercises. 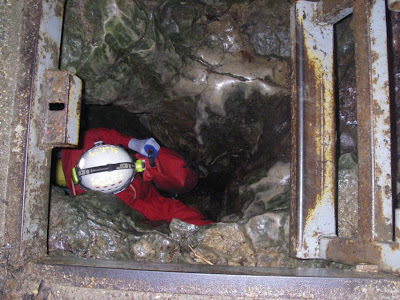 There's nothing like a little mud, hard rocks, and tight spaces to make doing a rescue a little more challenging. 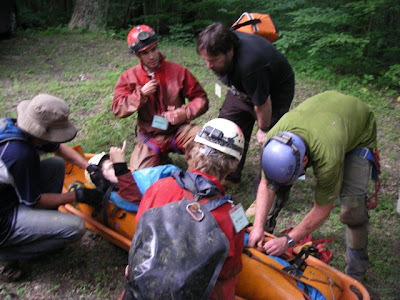 We practiced packaging a patient so that he wouldn't get hypothermic and then hauled him up. 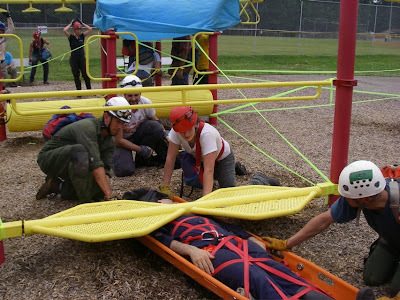 There was also a team practicing doing lowers in case the patient needed to go down. 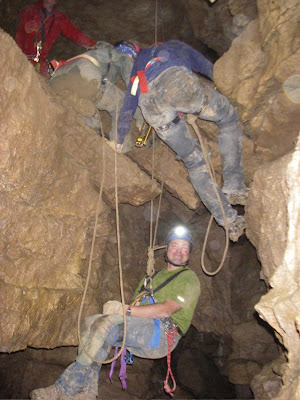 If gravity isn't in your favor, you need a haul team to pull the person up, generally with some mechanical advantage because there aren't too many caves that have room for a huge number of people pulling! Over the next few days I'll post some more photos of the seminar and a peek into a rarely-seen activity. ...and bailing out of the back of the plane with his monkey when the going got rough. I'm still doing loads of laundry and sorting photos but hopefully will be up to speed soon. Desert Boy and I are leaving the desert for a bit and going to visit the grandparents in the Midwest. My wonderful husband is going to stick around and help keep the ranch running--and water my garden! 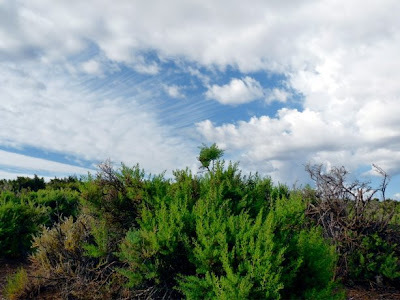 I'll be offline for a bit, but I'll keep my A Plant A Day blog going with autoposts. I've gotten to see some more interesting birds early in the morning lately. 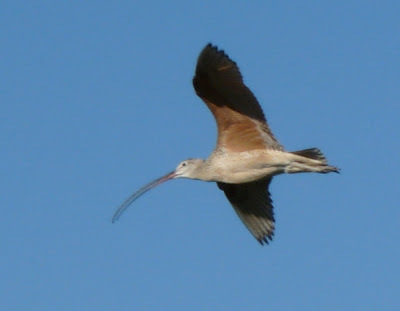 One is the Long-billed Curlew. It definitely has a long bill. And its voice sounds sort of like cur-lew. If more birds were named like this, I think more people might get interested in bird watching. When you have names like Sprague's Pipit or King Rail, it's just hard to visualize a bird. And it wasn't just one bird, there were several. They were a noisy gang. 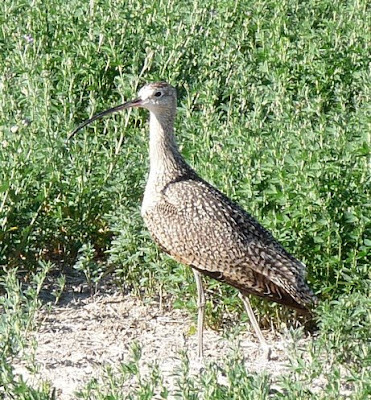 I really enjoy watching long-billed curlews, though, and overall their population is declining due to reduced habitat. So I feel good that they are doing well out here. 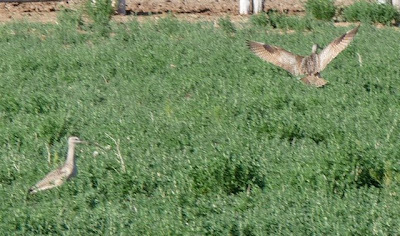 With that long bill, they are even easy to recognize in flight. 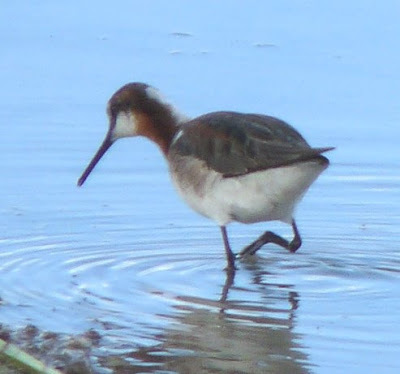 On a different survey, I was walking along listening to the million and one meadowlarks when I came upon this silent bird at the water's edge. 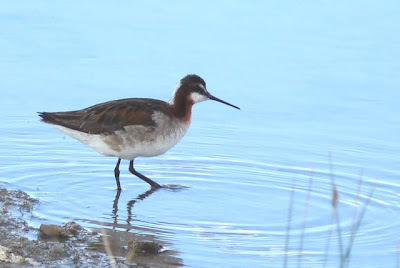 It's a Wilson's Phalarope, and it was all by its lonesome. 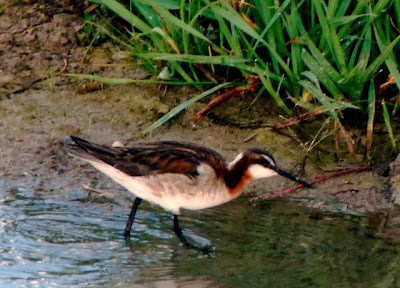 It likes to hunt for insects in the mud, and its longish bill helps it probe the water bottom. It never made a sound as I watched, just hopped here and there. 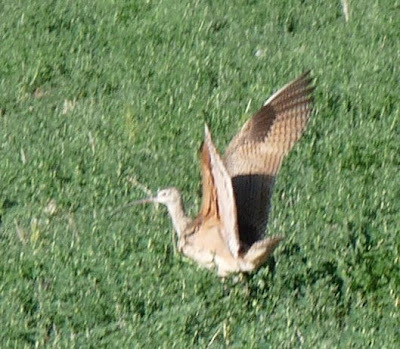 It's quite an interesting-looking bird, and it was fun seeing something out of the ordinary. I forced myself to go back to birds and was rewarded seeing a mother mallard and her little ducklings. 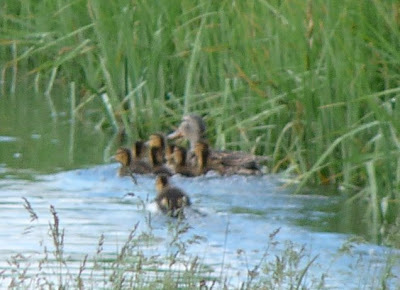 Last year I saw mallard ducklings in almost the exact same place. Perhaps next year I will see some again? Although life is full of change, it's nice to have a few things stay the same.